Our little girl was turning two and we wanted to do a really special, girlie and pink tea party to celebrate her second birthday. Thus, Tea for Two was born! I have two and a half dozen vintage tea cups and saucers that belonged to my beloved Great Aunt. 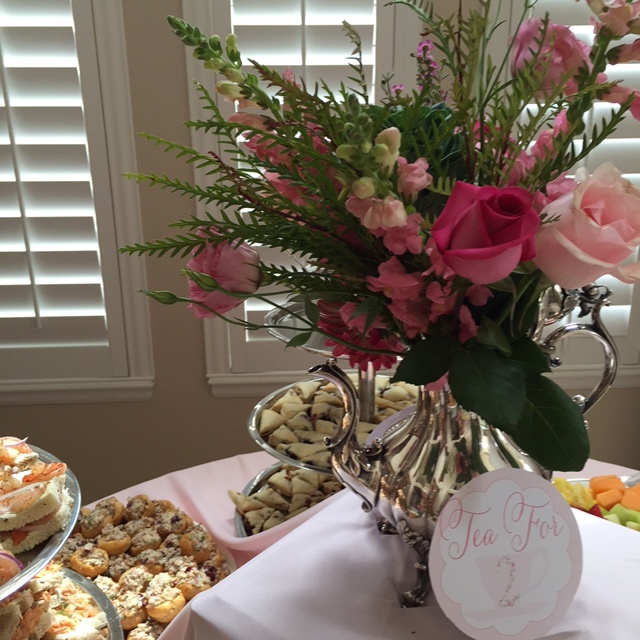 I wanted to use these for Audrey's party and create a formal, yet kid friendly tea party for all to enjoy. I later found little pink and purple teacups with straws on Amazon and everything kind of fell into place around the teacups. 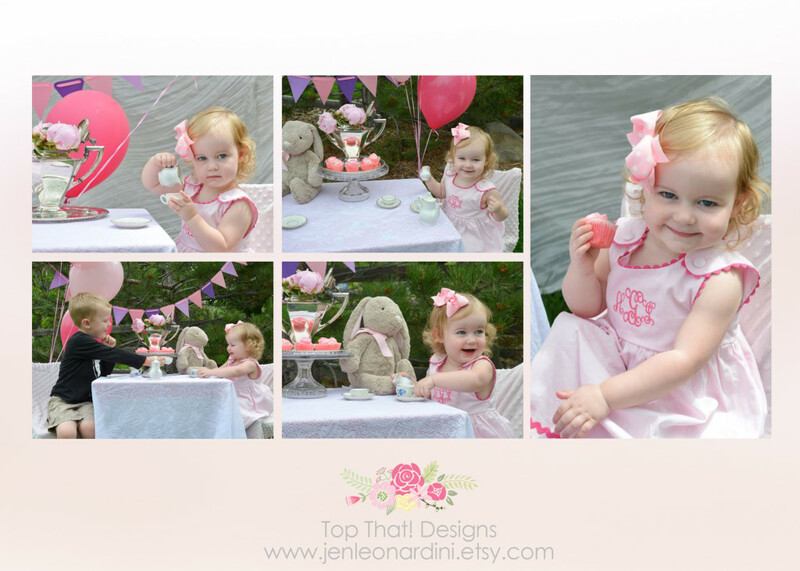 A couple of months before her birthday, we had a dear friend, who just happens to own Lissa Photography come take some photos of Audrey in a tea party styled photo shoot. We set up our back yard with a little table and set out a silver tea pot with flowers, a little tea set that was mine when I was a little girl, and some pink cupcakes. Audrey had a ball playing tea party and our friend was able to get some really great photographs. We then used those photos on the invitation, on our favor sign, and on our thank you cards and we have a ton of cute photos to treasure for a life time! The owner of this Etsy shop is an old friend of mine and literally brings any idea I have to life. I started talking with her about the invitations a few months in advance and once we conceptualized those, the rest of the print items were tailored to match. She's amazing! Food: Footers Catering Denver, CO. I outsourced the majority of the menu to my company and they did a wonderful job with the salads, tea sandwiches, and scones. My Mom and I filled in the buffet with fruit and "kids tea sandwiches" which were PB & J and Turkey and Cheese. We cut these out with these really cute cookie cutters that I found on Amazon. Yours Truly did three flavors of mini cupcakes, three flavors of french macaroons, a small cake, and teabag cookies for us that they even integrated a custom "tea for two" tag onto. Everything was adorable and delicious! Runners: Rental costs for runners were similar to the purchase price so I purchased these, knowing I would use them for future parties. What's not to love about polka dots and white lace? Flowers: We purchased bulk bouquets and roses at Costco and my fabulous friend put them together for me! 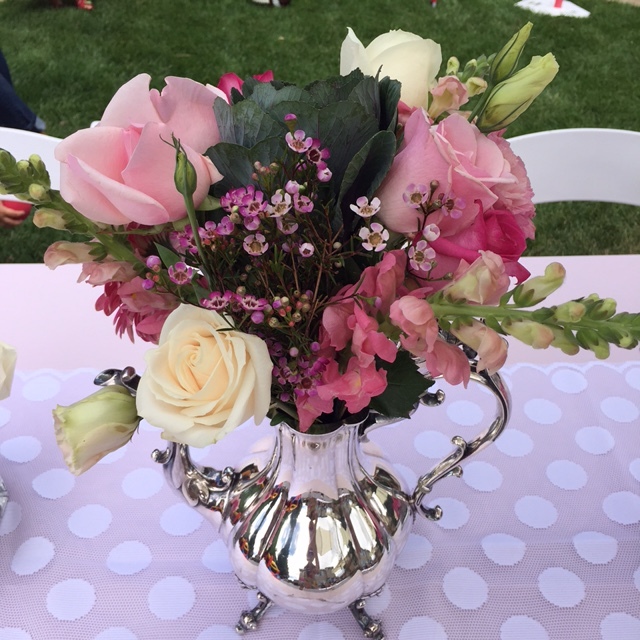 We used a variety of cube vases that we dressed up with some pink ribbon, a glue gun, and a "Tea for Two" graphic for the medium centerpieces and then used silver teapots belonging to me and my Mom for the larger centerpieces. A few little teacups each with a rose inside and our flowers were complete! Adult teacups: A beloved personal collection that belonged to my great Aunt. Kids teacups: I found these on Amazon and fell in love with them. I added on the little tags created by Top That Designs for an extra special touch. The tags said "Drink Me", "Happy 2nd Birthday Audrey", and "Tea for Two". All of the kiddos got to keep these little cups at the end of the party. 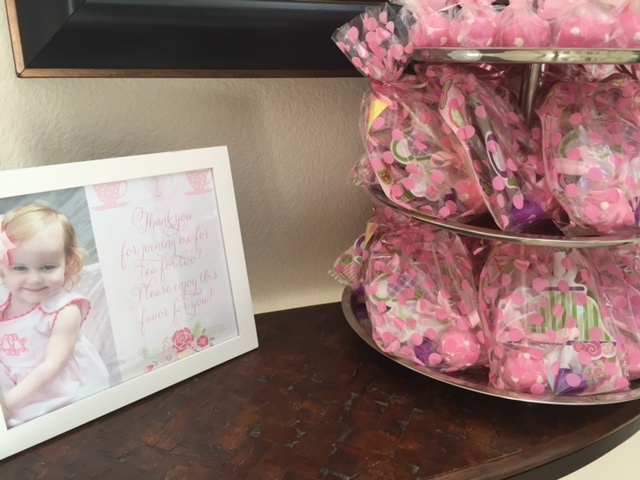 Favors: Each guest received a favor that included a cake pop (made by a friend), a tea party blowout, and a sheet of tea party stickers. Blowouts and stickers found on Amazon. Sugar cubes: These were a cute little detail item I found last minute on Amazon and felt like we HAD to have. It's hard to just pick one! 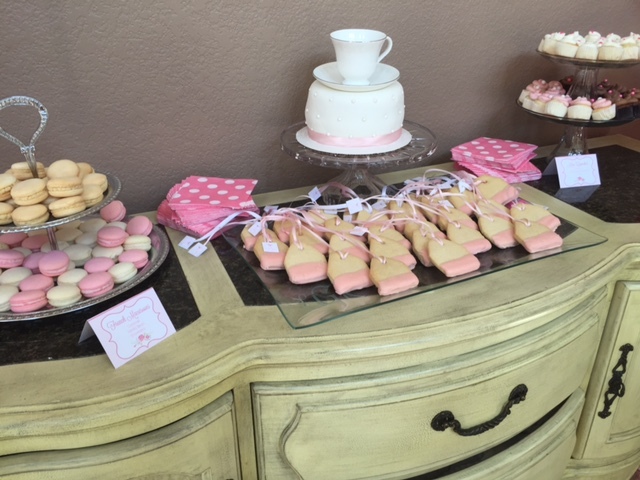 I especially loved our daughter's dress, the vintage and kiddo teacups, floral arrangements, and the menu selections (dessert included!). I always like to start planning really far in advance so that once I come up with a theme, I can begin acquiring items for the party. That way, all costs don't occur at once and you can also keep your stress level down. Kids parties should be all about the fun and celebrating your little one and not about you feeling overwhelmed by cost or projects that you have on your to do list. Remember that old saying "It takes a village"? Delegate. I had my Hubby, Mom, Dad, and lovely friends all helping out and that resulted in everything being set up on time. I actually got to shower and get ready before the party. It was incredible! I recommend utilizing a combination approach of DIY and not. For this party, we had the items professionally designed but then we printed and put them together at home, and we DIY'd flowers, the drinks, some of the food, and the favors. Then I enlisted the help of the professionals that I work with on a regular basis. I know and trust the rental company, bakery, and caterer that we used and I knew they would do a beautiful job. However, for another party, this might mean ordering pizza as opposed to cooking the whole thing yourself. Whatever you do, just make sure that you get to enjoy the party with your little one because that's what it is all about! Finally, don't do cake too late. You'll see in the last photo that Audrey does not look amused. She wasn't. While we scheduled her party around her nap (which is always a recommendation), our poor sweet girl was ready for her nap, but not without a little cake first! I'm a 33 year old Mom of two, living in Castle Pines, Co. I'm a working/SAHM hybrid and the wife of a pilot. I'm a lover of entertaining, cooking, wine, little details and fun! I work primarily from home as an Event Coordinator for the catering company that I've been fortunate to work with for nine years, Footers Catering. When not coordinating beautiful events for my clients, you can find me enjoying life with my two year old daughter Audrey, my five year old son Landon, my husband of nine years Ryan, and our eleven year old boxer puppy child Cali.